Our urethane bonded pistons are manufactured from a proven urethane compound that delivers excellent resistance to tear, abrasion and extrusion while maintaining high mechanical properties. The bonded design provides this piston with the strength to handle drilling pressures to 7,500 psi (51.7 MPa) and resists damage and fatigue during thousands of operating cycles. The core of our piston is the proprietary polyurethane compound, which is stronger and more chemically resistant that others in this field. Our standard bonded- polyurethane piston is suitable for operation up to Maximum operating temperature is 180 Â°F. These standard pistons can be operated at pressures up to 7,500 psi (51.7 MPa). 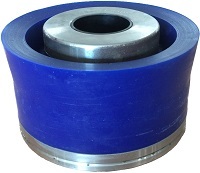 Our high temperature urethane bonded mud pump pistons improve drilling contractor economics through advances in technology, improved process control and increased drilling penetration rates. This advanced proprietary chemical formula provides increased resistance to water, oil and synthetic drilling fluids, while providing increased temperature, abrasion and particle embedment resistance. The advanced polymer compound provides strength to withstand chemical attack from additives used in today's oil, synthetic and water based drilling fluids. The compound also has improves abrasion resistance from drilling solids suspended in drilling muds and excels in high temperature performance capable of operating in fluid temperature up to 300Â°F. Our improved process control, allow us to monitor the piston body by engraving the manufacturers dates on each product. CNC machining of steel piston heads yields close tolerances for improved performance. We bring the benefits of our bonded-piston design with a nitrile-based elastomer compound for water-based drilling fluids. While urethane pistons can be used in water-based muds, they perform best in oil-based and synthetic fluids. The best option for water-based drilling fluids is the nitrile-rubber compound. 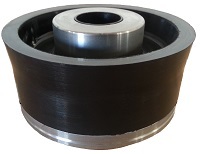 Bonding the rubber to the metal hub provides the strongest, most extrusion-resistant style of piston available and also minimizes any leak paths from forming on the inner diameter of the piston. The bonded-lip design has an open inner sealing lip that also enables the rubber to expand inward as a result of thermal expansion without excess loading of the sealing lip. With proper cooling and lubrication from the liner-wash system, the bonded-nitrile piston can be used successfully at temperatures up to 250Â°F (121Â°C). Our replaceable rubber piston is made with nitrile rubber to resist extrusion and abrasion. 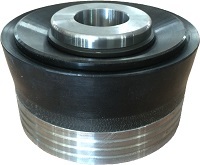 The two piece design allows for rubber replacement at lower operating pressures, while the robust construction makes it suitable for running at pressures up to 7500 PSI. 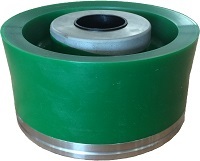 In a very wide range of drilling conditions, the replaceable rubber piston can run in fluids from clear water up to heavy weight drilling mud. These pistons are fully interchangeable with most other manufactures products. Available sizes range from 3" through 7-1/2â€�.